Authentic, Hand-Tossed New York Pizzas Take Over Florida! Our menu offers a wide array of unique New York style, mouth-watering flavors. The recipes we use have been handed down from generation to generation within our proud family. Each menu item is made from scratch and uses only fresh ingredients. From pizza to calzones to garlic knots to salads -- no matter what you order, you’re going to love it! We also offer catering, not only in Orlando and Winter Springs, but throughout Central Florida. We're Orlando's favorite catering company specializing in New York style dishes. Let us put your next event in a New York state of mind. Good, authentic Italian food is hard to come by. So it’s only natural that when you find it, you want to share it. That’s where our Italian style catering services come in. 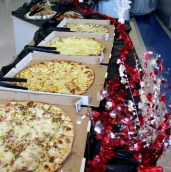 We can feed any gathering – from banquets to corporate luncheons to your family reunion. We know that quality and taste is important for any dining occasion, especially when there’s a big group of hungry people involved. Tomasino’s New York Pizzeria can suit all of your catering needs with a smile. 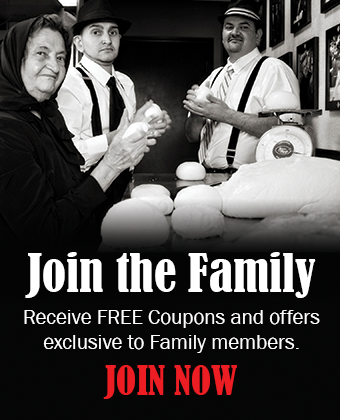 At Tomasino’s, you and your guests are part of the family! We know Italian food. Our recipes have been passed down from generations, leading back to our very own Nonna Tomasino from Italy. Our greatest joy is to bring these secret family recipes to your table, whether it’s a kitchen table or a banquet hall table. We don’t make any compromises when it comes to the quality of our food. Our pizzas are made from scratch, from hand-rolled dough to Nonna’s tangy tomato sauce. We never use canned or frozen ingredients. We think that should be illegal. When it comes to event catering, we know that a group of friendly-yet-hungry people can easily turn into an angry mob. Not to worry, we have a full Italian style catering menu to appeal to every last guest. From salads to entrees to desserts, Tomasino’s New York Pizzeria will cover all of your Italian style catering needs. Italian Catering Starters For starters, try one of our salad bowls that serve up to 20 people. Choose from all your favorites like Caesar, Greek, and our classic antipasto salad. Then, you and the gang can move onto an appetizer tray loaded with tender morsels like fried meat ravioli, classic fried mozzarella, or calamari. Appetizers aside, we know the real kicker is the main course of the event. We have a selection that’s guaranteed to satisfy, from party pizzas to a heaping tray of eggplant parmesan. If you’re going the classic pizza route, try our signature Don Tomasino for a pie you can’t refuse: a Bianca pizza with spinach, breaded eggplant, and tomatoes, all drizzled with our secret sauce. Pasta lovers can enjoy a make-your-own pasta tray by choosing from all your favorites. Entrée trays include all the best Italian dishes like lasagna, baked ziti, and chicken parmesan. Italian Catering Desserts We know that a sweet tooth is by no means a rarity, especially during a celebration. Our Italian style catering menu has a tantalizing selection of sweet treats for your event. No one can resist a tray stocked with authentic, NY-style cheesecake. For those with a hankering for chocolate, try our chocolate mousse or chocolate-dipped cannoli. Is your mouth watering yet? Good. 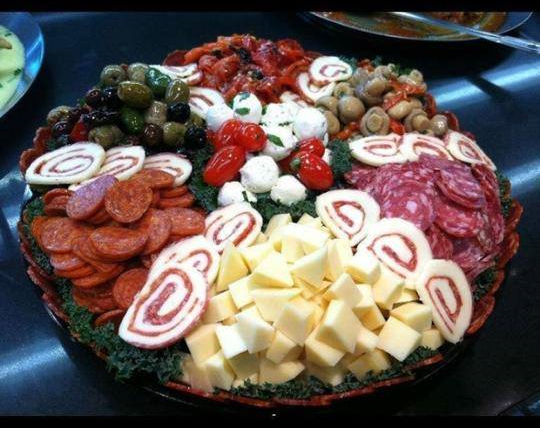 Call us today for the full menu and to arrange authentic Italian style catering for your next big event!